First Dates Hotel is a TV show on British national television from Channel 4 with an average rating of 3.6 stars by TelevisionCatchUp.co.uk's visitors. We have 18 episodes of First Dates Hotel in our archive. 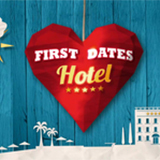 The first episode of First Dates Hotel was broadcast in April, 2019. Did you miss an episode of First Dates Hotel but don't you wan't that to happen in the future? Please set an alarm and add First Dates Hotel to your favourites, so we can remind you by email when there's a new episode available to watch. For free! 'Daddy cool' Darill and single mum Millie seem well matched, but there are some things you shouldn't say on a date... And retired psychic Marie's ideal man is someone no one could have predicted. Fitness fanatic Bernard, who's 87, meets ballroom dancing grandma Ruth. And the love triangle is resolved: does single mum Kaylee have a chance with cheeky Charlie after his date with model Jada? Nursery worker Kaylee meets tall, handsome Charlie by the pool. But she's supposed to be on a date with bricklayer Keiren and he's meant to be meeting model Jada. Handsome devout Christian Jordan survived a brain tumour at 24 and is ready to grab life and love with both hands. Meanwhile, comedian Louise returns to the hotel for a second date. Stand-up comedian Louise is known for her potty mouth but her love life's in the toilet. Can Gemma, who once danced with Prince William, find her Prince Charming? And electrician Eddie's back. Adam and Dean from Manchester check in for dates with best friends Kate and Charlotte. And can Peter - who has deaf parents and didn't learn to talk until he was seven - speak the language of love? A summer storm hits the hotel, but will lightning strike for blonde bombshell Bella and well-to-do Tom? And will Basement Jaxx singer Sharlene meet a man to share the spotlight with her? Sheila, who's 81, believes that life begins at 80. Eddie's a 'man's man' but talking to women turns him into a sweaty wreck. And can bank analyst Poppy find a man who'll see past her wheelchair? Can fashion model Kelly, street cleaner Bruce, personal trainer Joey, Scottish dancer Paddy, eco geek Finella and sustainable architect Richard find love? And how should you greet a lady in France? Mark - the former Dean of Rochester - is new to the world of gay dating. Can Balwant be his guiding light? Meanwhile, red-haired beauty Georgie is looking for a 'hot nerd'. A Place in the SunCatch Up on A Place in the Sun and watch online. Missed an episode of A Place in the Sun, broadcast by Channel 4? We give you an overview of all the latest episodes, so you can pick and watch your favourite episode.